Radon is a naturally occurring radioactive gas that can cause lung cancer. You can’t see or smell radon. Testing is the only way to know your level of exposure. Radon can have a big impact on indoor air quality. Western Counties of North Carolina are all zoned either 1 or 2 (with a moderate to high potential of Radon risk) and zones can be seen on the EPA website. 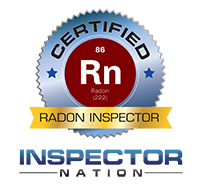 Blue Mountain Home Inspections offers Radon Testing for an additional fee. Some things to know about having a Radon Test.